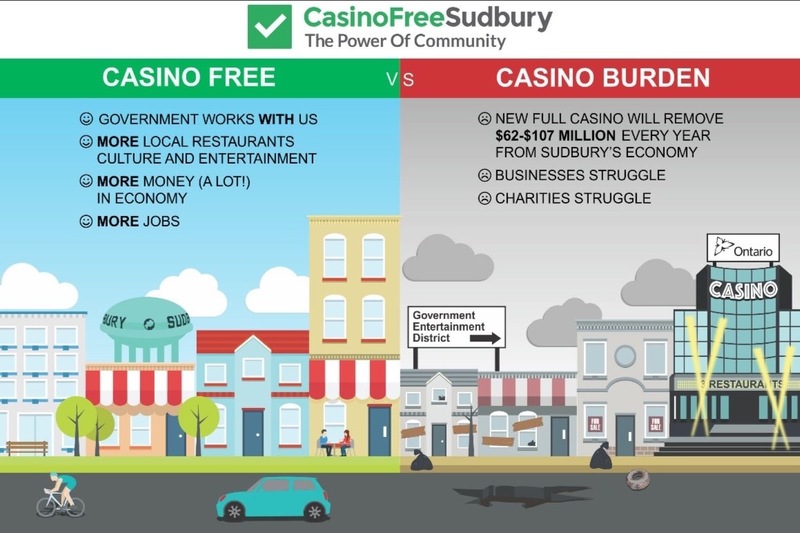 There are many in our community opposed to the establishment of a full casino in Sudbury. Whether your concerns are economic, cultural, social or environmental, it is only by combing our efforts into one, that we have a real chance of preventing this project from moving forward. In preparation for our appeal we have commissioned an economic impact report , planning reports, legal opinions and have retained legal council. We are ready to act following the city council decision on April 10th, through LPAT submissions to the OMB. We intend to appeal the casino rezoning, event center rezoning, and the casino official plan amendment. Along with a separate legal fund campaign for businesses, (which has raised 160K of its 250K goal) we are asking the citizens of Sudbury to contribute. While the LPAT process is simple, the preparation of the appeal has been extensive , and it is likely the appeals will result in hearings. Lets all work together to get our city back on track towards sustainable economic development where we embrace all that makes our city a great place to live, work and play! Thank you for standing up for your community! NOTE: Any funds remaining at the end of the campaign will be donated to The Fabio Belli Foundation. The LPAT Fundraising Dinner on Thursday Feb 21st at the Caruso Club is now 75% sold! We do expect to sell out and have seen a very diverse group of citizens from across Greater Sudbury buy tickets. Please get your tickets soon and come out and have all your questions answered about the process. There is also some amazing local art to be auctioned off including a very special painting by Monique Legault. Your community needs you there! We have organized a fundraising dinner on Thursday Feb 21, 2019 at the Caruso Club help deal with the increased costs of this effort. 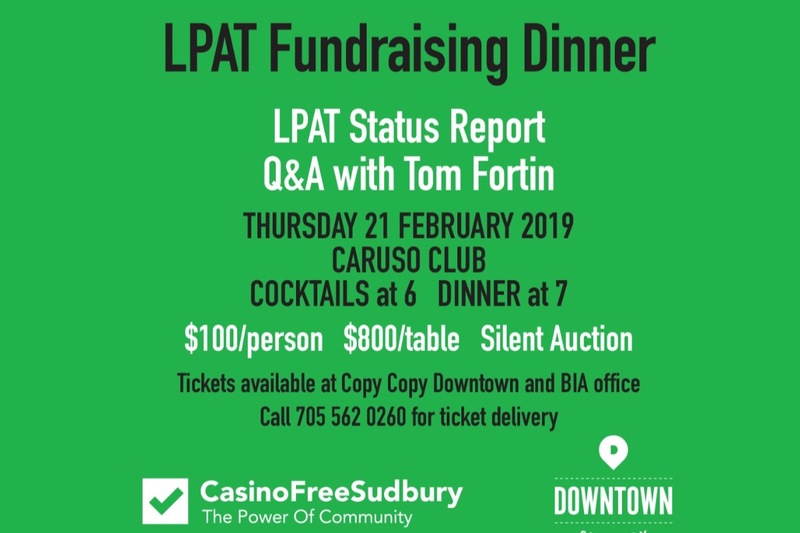 Tom Fortin will provide an update on the LPAT appeal and there will be time for a Q&A so you can have any questions about the appeal answered. There will be a silent action and a chance to meet other like minded people. Please share the image below on social media! The Case Management Conference (CMC) for the Sudbury arena/casino appeal was conducted on Nov 6th, 2018 at the Provincial Building in Sudbury. There were a number of developments at the meeting that have added complexity, time, and costs to the process. Rail Deck Decision Suspends Timelines. The LPAT process is new, and the CMC in Sudbury was only the second such meeting held. The first was held in Toronto on September 20th, 2018 concerning a proposed $1.6 Billion development (Rail Deck LPAT Appeal). At that meeting both sides of the table expressed concern for their lack of right to examine, and cross-examine, witnesses according to LPAT rules. This fundamental right is one of the two key tenants of natural law. It was agreed by all parties to refer the question to divisional court for a ruling on whether LPAT can deny this fundamental right. The divisional court will provide a ruling which may take several months. Until a ruling is sent down, all LPAT proceedings where professional witnesses are expected to be called will see a delay in scheduling of hearings, including the Sudbury case. The ruling could be made as early as January 2019, although, an appeal of the ruling is also possible. The bottom line is that the official timetable for the Sudbury case is now officially suspended and we will not know the hearing date for several months. At the first CMC meeting in Toronto the hearing date was set for May 27, 2019 before the divisional court question was proposed. This is over 8 months from when the CMC occurred. The tribunal agreed to hear several motions from both sides of the appeal. The motions and replies from opposing counsel must be submitted by Dec 19th, 2018. The tribunal will then provide a decision in January 2019 on all motions. The motions by the city include a question on the jurisdiction of LPAT in regards to bias, and the casino willing host question. Motions from the appellants include requests for production (asking the city to provide certain documents), and another asking for a "right of reply" to opposing synopsis. A second CMC hearing is expected in late January 2019 where a hearing date will be set, provided the divisional court has ruled on the right to cross-examine. In the meantime we will be stepping up our fund raising efforts as the costs for this effort are expected to rise considerably due to a longer hearing.